German-based Maturo is a global specialist in electromechanical positioning systems for EMC, automotive, radio and radar measurements. 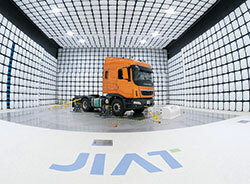 The only reliable way to test the EMC properties of heavy trucks and buses weighing tons is using a facility with interference-free control based on fibre optic communication, which supports precise positioning of rotary tables up to 14 m diameter. Flexible PC-based control and drive technology are key factors for Maturo’s ability to cover a wide range of applications and diverse customer requirements. Maturo offers a wide range of rotary positioning tables for application in EMC cabins and in field installations. The table diameters can range from 0,3 up to 14 m, with payloads between 10 kg and 100 tons. Manual, semi or fully automatic antenna masts and tripods for different measuring heights or loads and movements are used for positioning the required radiation antenna. The overall facility is operated with three controllers developed in-house, including the new NCD, which can control up to eight multi-axis devices. These can be comprised of any combination of antenna masts, rotary tables, rotary units, sliding tracks or other positioning devices. The flexibility of the automation technology from Beckhoff also benefits Maturo in other ways. One aspect is the use of optical fibre as transmission medium. Lehner explains: “Without fibre optic technology, our solutions would not be possible. A key factor is that this type of cabling can be seamlessly integrated with the control technology we use. In contrast to many other systems, PC-based control offers the capability of holistic system integration, without the need for an intermediate LAN to fibre converter.” This is implemented in the new NCD controller, which includes four EK1521 EtherCAT fibre optic junction terminals, through which all other devices are addressed. A customised CP6907 control panel ensures optimal usability, while a CX1020 embedded PC provides the required computing power. TwinCAT NC PTP software is used to control the numerous axes in the application. A TwinCAT XML Data Server handles the data management, while a TwinCAT TCP/IP Server supports communication with the higher-level control system. For more information contact Michelle Murphy, Beckhoff Automation, +27 (0)11 795 2898, michellem@beckhoff.com, www.beckhoff.co.za. EtherCAT measurement modules now include the cost-effective ELM314x Economy line.